Fortress Of Freedom Board :: View topic - C.A.L.M. Protests At Metro Police Headquarters! C.A.L.M. Protests At Metro Police Headquarters! Posted: Sun Apr 18, 2010 2:12 pm Post subject: C.A.L.M. Protests At Metro Police Headquarters! 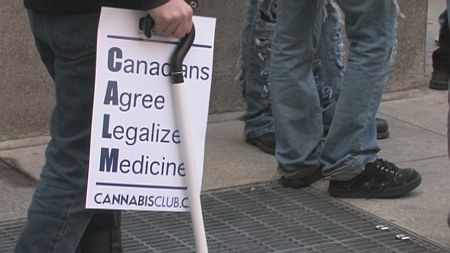 April 11, 2010 - Toronto, Canada - Members for the medical marijuana community called C.A.L.M., and supporters, converged on Metropolitan Toronto Police headquarter at 40 College Street to demand back marijuana confiscated during a recent raid. 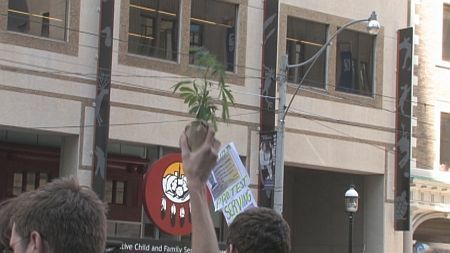 The group wich totaled about fifty people stood on the sidewalk opposite police headquarters chanting, giving interviews and waving placards and marijuana plants. The Police responded on the other side with unprecedented numbers and barricades. The actual raid on the offices of C.A.L.M. and the actual reasons behind it are still far from certain. C.A.L.M. 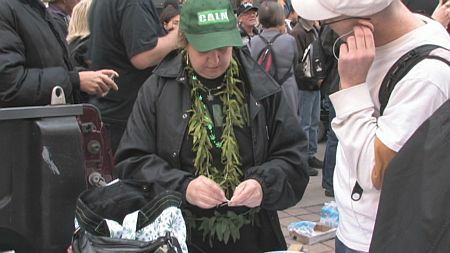 claims (in it's news release handed out to the media and reproduced below) the raid took place on March 31,2010 and four of the community were arrested even though all were federally licenced to use marijuana for medicinal use. 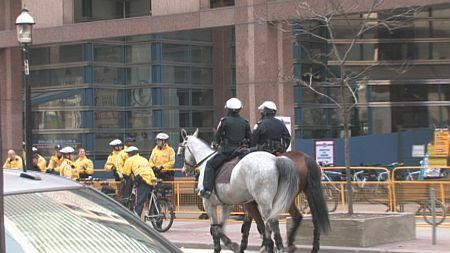 Part of the large police force at the protest! A few of us from IAIJ went to the protest because protests are one of our specialties, archiving the small voice asking to be heard. Ainsley's take on the event was rather short and pointed: "It's stupid! They say you can't smoke it. Then they say you now can. And then they say you can't. It's Stupid! My (Maurice Ali) take on it is that there are too many unanswered questions. Police have broad discretion in enforcement, but if a complaint was registered by someone, then they may have no choice but to act. So we really don't know if the police targeted the organization of their own accord. In the end it all comes down to poor lawmaking from our politicians. 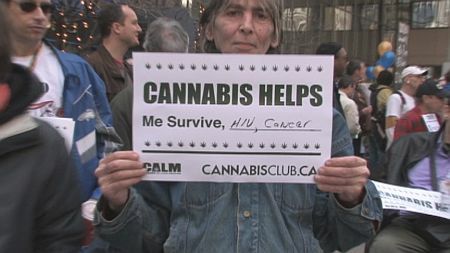 Things are more clear-cut if it was all illegal or all legal. 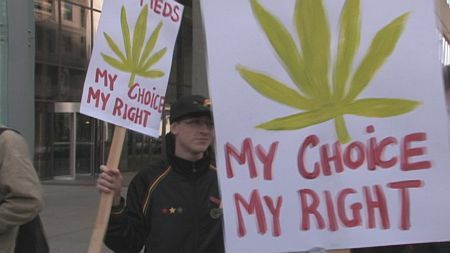 Saying that some can smoke marijuana and others can't, or that it is illegal to grow marijuana for all except some that get a permit, allows for a very grey area that can be interpreted different ways by police and users. As for the protest itself, some have criticized the protest for not targeting the Parliamentary Buildings to change the laws because all the police do is enforce the laws. 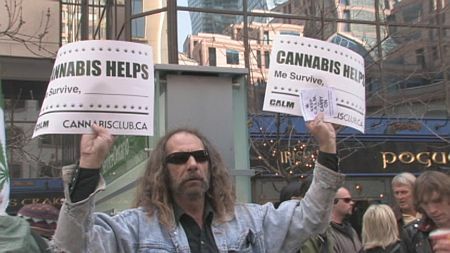 However in practical terms, having the protestors being photographed with the police presence in the background is far more compelling to the general public, and the group were asking to have the marijuana from the raid returned to it's legal owners. 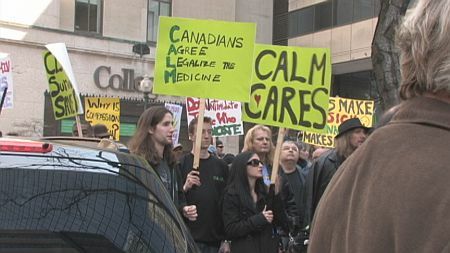 So we offer up to you some photos of the protest along with C.A.L.M. 's leaflet handed to the media. 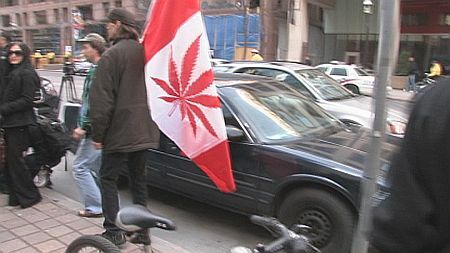 Comment from the Toronto Metropolitan Police got nowhere from phone calls to trying to cross the street to police headquarters.